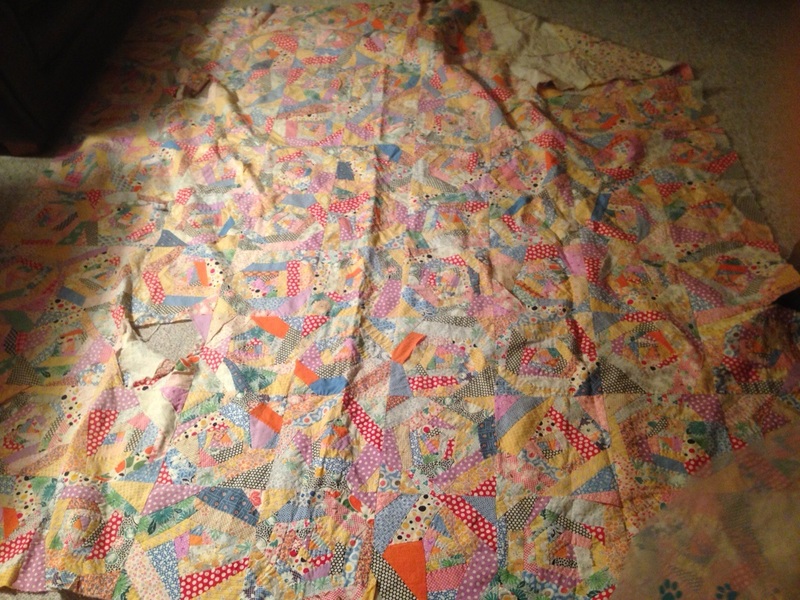 Last fall I had an old school mate ask me if I could restore this antique quilt top made by her grandmother. 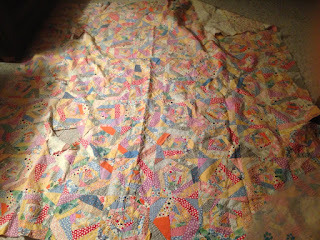 The quilt top had never been finished and was not in very good shape. 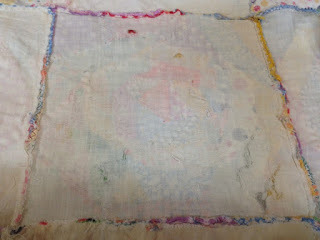 There were a few missing blocks, the outer edges were frayed and the hand stitching on many of the blocks were coming apart and some of the fabric was so fragile and would need to be replaced. 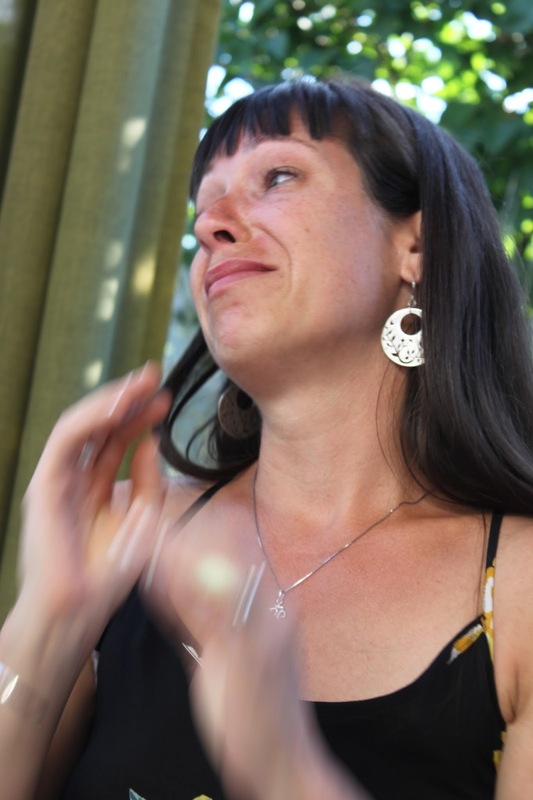 She indicated that she had taken it to a number of people who said it was impossible and could not be done. I looked at the top and thought about the maker and the many hours she had spent hand piecing it and I thought about how much it meant to my friend. I thought about all my unfinished projects and how I would feel if someone took the time to finish one of them if I were not able to. It would take a lot of hard work and many hours to do. In my mind I was saying "No don't do it!" But my heart took over and I said " Yes I think I can." I don't know if it was because my friend was told it couldn't be done or the fact that it meant so much to her that she wanted to pass this quilt top onto her daughter at her upcoming wedding. But it became my challenge for the next 6 months. Since the blocks were foundation pieced, and the foundation was in poor shape , I wanted to add a new foundation to add stability to the quilt blocks. My first job was to take the quilt apart. I unstitched the quilt so I had each block separate. Some of the blocks were in too poor condition so I set those aside. They would be used to repair the good blocks. I used a product called "Shape Flex" as the new foundation. It is a lightweight fusible interfacing that is often used in quilts that contain embroidery. I worked really well and added a bit of body to the quilt blocks. My next step was to repair the seams and to replace any worn out parts of the blocks. I used a tiny blanket stitch and Bottom Line thread in a color that blended in with the fabric.I restitched each seam and replaced any damaged fabric, Since the thread was very fine, it was almost invisible. Once all the blocks were repaired, I squared up the blocks so they were slightly smaller than the original ones. By doing this I was able to trim off any of the frayed edges and make each block the same size. I sewed the blocks back together. The restored quilt is slightly smaller than the original one. I choose a thirties fabric for a backing and cotton batting and then machine quilted the top. I finished off the quilt by adding a label which told of the quilt maker, and the quilts history. Here is the daughter's reaction when it was presented to her. I'm so glad I completed the restoration! All the time and effort was well worth her reaction. My studio is in a log building that is 20’ x 28’. On the main level, I have my cutting table, fabric, batting, ironing board and an Accuquilt cutting station. This is also where I set up tables and sewing machines when friends come over to quilt. There is a 2nd story loft in my studio where I have my quilting machine and do my sewing. Since the ceiling is 16’ above the main floor, the lighting on the main floor has never been very good. I have two large windows in the gable ends that give good light in the daytime. But at night, the one light on the ceiling fan just doesn’t cut it. For years I have complained about it. I’ve had numerous electricians out to advise me what I can do to get the light down where I need it, but nobody wanted to tackle the job. In the summer, I had a lady visit my studio who owned a lighting store. She knew just what I needed. I ordered the lights immediately. I knew that the installation was not going to be an easy job! New wiring would need to be done and how do you run wiring in a log building that is already finished? Finally, this week the work has begun. My husband had to tear out a small wall so the electrician could run some wiring. Right now my studio is filled with some ten foot high scaffolding and there are tools everywhere. But it is really exciting! Hopefully by the end of tomorrow I will have the lighting I have only dreamed about. Of course there is also going to be some work to repair the wall and I will also have some additional exposed wiring that I never had before . But I think that will be a small price to pay for the extra light. I presented my brother with his quilt last night. I think he liked it! I have 2 wonderful brothers. I love them them both. My brother Aaron has had a love affair with hockey from the time he was a little kid. We lived in a heritage home where the basement wasn't finished. So this was a perfect place for Aaron to practise his shots. He spent hours down there picking the perfect spot for his next game winner. I'm sure my parents were the only ones who ever had puck marks all over their furnace. Aaron played for a lot of teams. And I think he could have made it to the NHL. He was and still is an awesome player. To this day, he still plays hockey throughout the winter and he makes a home ice rink for his kids. But I think he likes it best! I wanted to make a quilt for him that depicted his love of hockey. He is almost 50 years old and still has a lot of his jerseys. So one day I asked his if I could have them. He reluctantly handed me a garbage bag full of his jerseys. He also included a few softball jerseys just in case I didn't have enough. He said take good care of them. I told him I would make him something special out of them. Well my way of taking care of them was to cut them apart. As I did so, I was so worried that my brother would be in tears if he saw what I was doing. I carefully fused each jersey front and back to a fusible interfacing then cut out quilt squares. Some of the jerseys were not in great shape so some I mended and some I used only the best parts. Then I added a border to each block and some sashing I finished the quilt off with a wide border. On this border (with the help of my Accuquilt studio) I added his name and the words "He shoots, He Scores" and some maple leaves . The quilt is now waiting its turn to be quilted. Here are a few pictures. The quilt is quite large and I don't have a place large enough to lay it flat for photographing so I can only show parts of it. Like many of you, I enjoy my summer vacation. My husband and I usually take the opportunity to do some camping, swimming and hiking. (He does the hiking and I do the swimming.) 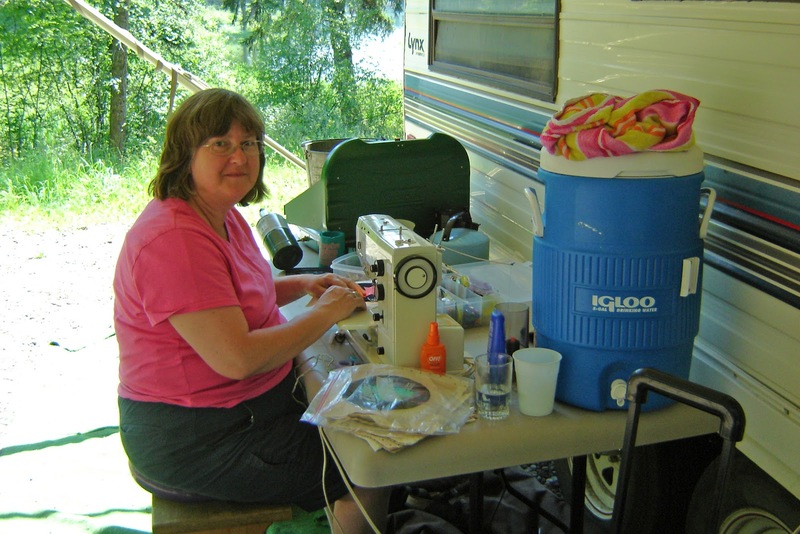 I also love to take my sewing machine along to do some quilting. A few years ago my brother gave me an old generator that would run my machine and I was hooked. I open the awning on the trailer and set up one of those fold up tables. On goes my cutting matt and sewing machine and away I go. It is so fun to sew outdoors in the fresh air! If you have never tried it, add it to your to do list.You will love it! When I get hot, I go for a dip in the lake or creek we are camping near. Or, I will spend a little time fishing. I never catch anything but I don't try very hard because if I ever caught something, I'd have to clean it. This is one of my favorite places to camp. Lots of childhood memories here. This year, I brought one of my UFO's. I'm happy to say that it is almost finished. I just need to add the outside border and I am done. I didn't think I'd get this far so I didn't bring the border fabric with me. The quilt is out of the book " Slice 'Em & Dice 'Em" Quilts by Nancy Brenan Daniel. The pattern is called "Scrap Bag Shadow Boxes". To make this quilt, you make blocks in pairs. You started out with two different Nine Patch blocks that you slice a couple of times in each direction. Then you take out the middles and trade it with the other block and then sewed then back together. The blocks you get look a lot more complicated than they really are. This quilt has been hanging around for a long time so I'm glad to be almost done. I also worked on a new quilt I kind of designed. I say kind of because I really started out making a quilt called " Winter Cottage" from the book " 'Tis the Season" by Jeanne Large and Shelley Wicks. It is my favorite book. 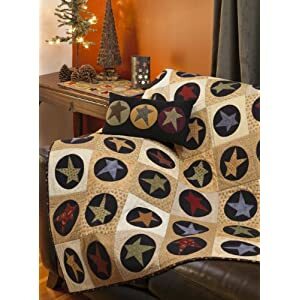 That quilt had light colored 8 inch blocks with a black appliqued flannel circle on it and then an appliqued star. 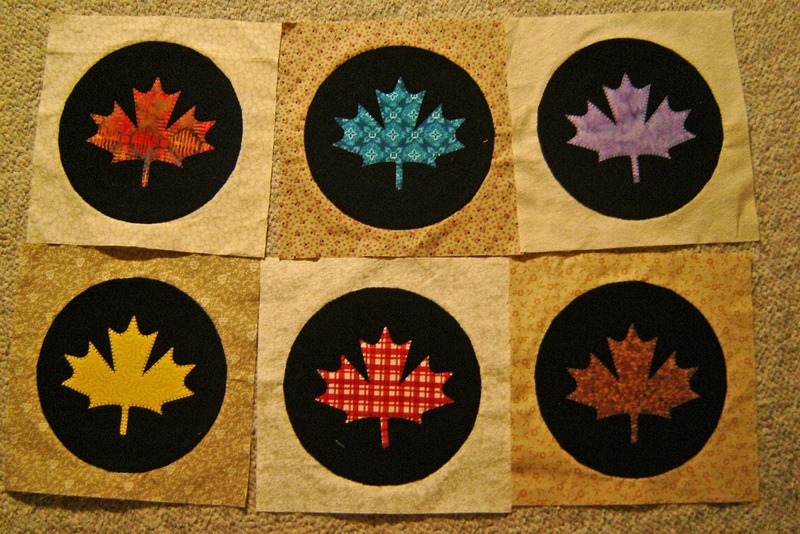 I exchanged the star for a maple leaf for a more Canadian looking quilt. My Quild Guild has a challenge this year to make a stash quilt. So this is my stash quilt. I used many different beiges from my stash for my background and I used black flannel for my circle and scraps for my maple leaves. I didn't purchase a thing. I think of it as a free quilt! I'm not going to make this into a huge quilt. I think it will be a nice size to cozy up on the couch with. I used my Accuquilt Studio to cut out all my shapes. It took no time at all. This is the quilt from the book. Here is a few of my blocks. I thought you might like some inspiration! Here are a few quilts I saw at the Salt Lake Quilt Show. This is the maker of the Best of Show! You might recognize the quilt. It is on the cover of June/July Quilters Newsletter magazine. The quilt is called "America Let It Shine" and the makers name is Sherry Reynolds. 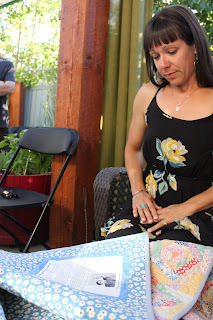 Check out Quilters Newsletter to read the article and see her amazing piecing and quilting. And it was done on her home sewing machine! This quilt was on the brochures etc for HMQS. The theme was "Star Spangled". This Amish syle quilt had beautiful quilting. Ever wondered what else you could do with quilts? This vender made the most beautiful footstools from them. This quilt of Jack Nicolson was so real looking. The maker must have been a real fan! Couldn't you fall in love with this little girl? Sunflowers make me happy! These ones are beautiful. Many people start these quilts but many don't ever finish. This one is spectacular! Scrap quilts are my favorite . This one was really nice. I love to learn new things. Each year I treat myself to a week of learning at one of the many Quilting Conferences held throughout the USA. I have been to Innovations in Tacoma Washington, to MQX in New Hampshire and HMQS in Salt Lake City. Each of the conferences have a quilt show, classes with amazing instructors and of course merchants. Lots and lots of merchants! The Conference in Salt Lake City is my favorite. This was my 5th year attending that show. I look forward to this week for the whole year! This year I was able to take classes with Dusty Farrell. Cathy Franks, Carmen Geddes, Bobbie Bergquist, Sally Terry, Jennifer Alexander, Renae Haddadin, Judy Woodworth and Sue Patten. Each instructor is a amazing at what they do. Sometimes I take classes to learn a new skill. Sometimes I take them for inspiration or to learn something I've never tried. I thought you might enjoy a few picture of these talented instructors work. Cathy Franks is an international award winning quilt artist. Here is an example of her work. Dusty Farrell's White Tail Deer quilt has won many award. He is well know for his Quilting in the Dark Class. Check out this class on utube. It is free motion longarm quilting in the dark using ultraviolet light and uv reactive threads. I took his Echo Puzzle class. Renae Haddadin's quilts are amazing! She is well know for her amazing rays. Sue Patten is a Canadian quilter we can be very proud of . Her quilts are are the best use of thread I have ever seen. Sue uses verigated threads and counts the stitches to achieve the colors you see in her quilts. I'll share more another day!